Seoulsome: Cupcakes & Coffee @ Sky Garden, Hyundai. ﻿There is a small coffee stand situated in the far corner of the garden. Although the coffee was quite pricey it tasted pretty good and the added value to me was in the garden itself. For anyone who lives in the city, you will know how nice it can feel to get away from the imposing concrete jungle and the constant noise! 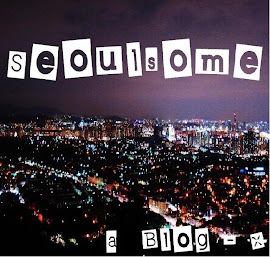 This place is an unexpected breath of fresh air right in the heart of Apgujeong! Coffee in the late afternoon sunshine. I picked up a cupcake, to go with my coffee, from my favourite counter (Goodovening Cupcake) in the basement deli section. You should definitely check out the grocery floor on B1 if you're after imported items or a special treat. I actually think it's interesting just to walk around and look at everything on offer if you haven't ventured into one of the department stores grocery sections before. 'Chocolate Cloud' Cupcake from Goodovening Cupcake. It was delicious! Can you tell? I loved the design of the garden, it felt so unlike Korea in that small space and far more European. It actually reminded me a lot of England with the Silver Birch trees, the pots of lavender and the fresh autumn weather. There was even a sign post displaying the distances to some of the worlds other great cities! It's 5,312 miles to London in England. I'm a long way from home but now I've found my slice in Seoul. ﻿How to get to the Sky Garden. This Sky Garden is located on the top floor of Hyundai Department Store in Apgujeong. Take subway line three to Apgujeong station and follow the signs to enter the store directly from the subway. Once inside the store you can find an elevator and take it to the garden, the floor isn't numbered but it's the button after the last number. It's marked inside the elevator too. There is also an entrance from the very top floor to the back right corner as you leave the escalator. I don't know if other Hyundai Department Store's have Sky Gardens too, I'll be looking out for them from now on and I'll update this post if I find out.